The recent cyclone and flooding throughout Queensland has provided an opportunity to rebuild devastated properties in a greener way, giving a jump to the efforts. Located on one of the Whitsunday Islands, near the Great Barrier Reef off the tropical coast of Queensland, Australia, the Paradise Bay Eco Escape hosts up to 20 people at a time in its ten luxuriously outfitted bungalows. 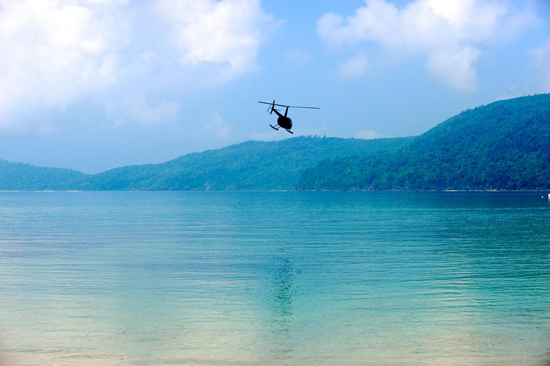 Guests must reach the resort by helicopter, so as not to pollute the Tiffany-blue water. There is no TV or Internet at the resort, and "women aren't getting their hair done," says Steve George, the general manager, but by the looks of the place, no one is roughing it either. In fact, it was only seconds after I entered the open pagoda-style reception area that I was handed a glass of champagne. Minutes later, a waiter came by with a tray of sliced baguette with red onion marmalade and blue cheese. When I politely declined, he brought out aracini: deep-fried balls of risotto with tomato and crab. The management's goal is to keep things simple. "It's a reconnection with nature and yourself," the general manager, Steve George, told me. That reconnection to nature may sound daunting to the technologically reliant, but it does include enjoyable activities such as snorkeling, swimming, kayaking, sailing, turtle and whale spotting, walking along the resort's private beach, and taking a ride on the resort's catamaran or fast rib boat. Underlying all of this fun, however, is a targeted eco-strategy on the part of the management. The resort uses a wastewater treatment system and 85% of its electrical energy comes from solar panels. The solar power is supplemented by natural gas and a bio-diesel generator, which provide electricity to the resort for about two hours a day. In addition, the resort plants trees off-site for every guest that stays there. The number of trees they plant depends on where the guest has come from and how big his or her carbon footprint is. But Paradise Eco Bay is not completely out of the ordinary for Queensland. "It's nothing new. A lot of people in Australia are socially aware of eco-tourism. You have to respect the land you walk on," said Melissa Webster, a representative of Queensland Tourism. "Everywhere you look here, it's recycle, reuse -- it's a way of life." In April 2010, the Queensland government committed to doubling the state's use of solar energy in five years. Only one year later, there has already been a 57 percent increase in installed solar panel systems. "The state government introduced special provisions for Queenslanders affected by these natural disasters to be eligible for rebates under the Solar Hot Water Rebate Scheme. This allows affected households to apply for rebates to install solar hot water systems to replace existing electric, gas or solar hot water systems destroyed or damaged during the recent cyclone and floods," said the Minister of Tourism, Manufacturing and Small Business, Jan Jarratt. Government rebate programs have worked well for Queensland. The Solar Hot Water Rebate Scheme provides $1,000 for pensioners and low-income households and $600 for other eligible applicants to replace their existing electric hot water system with a solar hot water system or heat pump. Since the initiative began in July 2010, over 14,000 households have received rebate payments. The Queensland Solar Bonus Scheme pays participating customers 44 cents per kilowatt for surplus energy generated by their household solar PV system that is exported back onto the Queensland electricity grid. Before the scheme started in July 2008, only 1,200 households were connected to solar panels. Today, more than 65,000 Queenslanders are participating in the scheme and providing enough energy to power 26,000 additional homes. Paradise Bay Eco Escape spent $150,000 to install their solar panel system, not a small sum for an accommodation that only hosts 20 people at a time. There is no long-term economic benefit to the resort, only the ecological one. Not everyone, in fact most people, are not so proactively charitable, especially in the current economy. Being able to sell your excess power to the government -- thereby making money off of being eco-friendly -- translates into real-time motivation for the masses. A solar-powered household here and there is not going to effect climate change, but government-sponsored rebate programs that enlist the masses have a much better chance.